I was able to go out and metal detect a couple times this weekend. The weather was nice and the ground was 90% thawed. I was fortunate to be joined by a long time friend and brother. First stop was a couple houses built around 1900 which has provided me a few wheats and a couple of Mercury dimes in the recent past. I was sure one of us would find a silver coin, but it wasn’t to be. We were able to pull a couple wheats and several modern coins. The coins rang up all over place for us, memorials rang up as dimes, dimes jumped between dime, quarter etc. Next we went to an older school which was nearby and finally my friend found a war nickel. At least one of us found a silver! Overall it was a good day to be out metal detecting. I went out yesterday and the ground was frozen as hard as concrete. Today the temperature was into the 50’s and the snow was disappearing quickly. I headed out to a local park right after work where old maps indicated four houses stood prior to 1937. It’s amazing how quickly a person looses that “edge” when taking an extended break from something. After a little bit I settled down, found a level of sensitivity I could work with and got to it. The area I expected to be my best chance to find something old was an area of strong EMI. I stuck with it a while and decided I will try again another time. Another area of promise was covered in modern trash. My yellow fella was singing the song of modern trash of foil, pull tabs etc. In some areas I received the hopeful sign of small iron targets, a sign of old nails etc. I do my best in those areas. Shallow modern trash blinds my detector to anything that might be deeper. Regardless of of settings, speed or pattern, my detector will hit too strong on those targets blinding me to other things including shallow modern coins. This is the curse of using a large coil which I prefer. In short, I found a clad quarter, dime and two memorial pennies in an hour. The partially frozen ground made my TID jumpy at best and screwed with my depth readings. I skipped a bunch of shallow pennies that wasn’t worth digging frozen ground for. Yep, I know I could have missed a ring and other good finds, but they aren’t going anywhere. Well it’s supposed to warmer tomorrow and who knows what I’ll find! Like most metal detecting fans we are waiting for warmer weather and the snow to melt away. We drive by our hunting spots or potential spots looking for areas without snow. I’ve spent my time researching, looking at maps and watching metal detecting videos chomping on the bit to get out digging. Maybe tomorrow, one area I just started detecting has potential, but has yet to turn up anything old is about 40% clear. I’m still not sure how frozen the ground is, but I’m going to try. I just wanted to say thanks again to those who go to great lengths to share their finds, stories and experiences metal detecting. I’ve learned a lot and it keeps me anticipating my next great find. Until tomorrow. I haven’t done well with keeping up with my blog. So here I am in 2014 determined to keep my blog up to date and find really cool coins and stuff. So check back from time to time to see if 2014 is a better year for me. So far 2014 is really starting well, 5 silver dimes and my first Barber dime! 2013 ended up being a year of frustration, learning and finding. I weathered through it and began to master my machine. 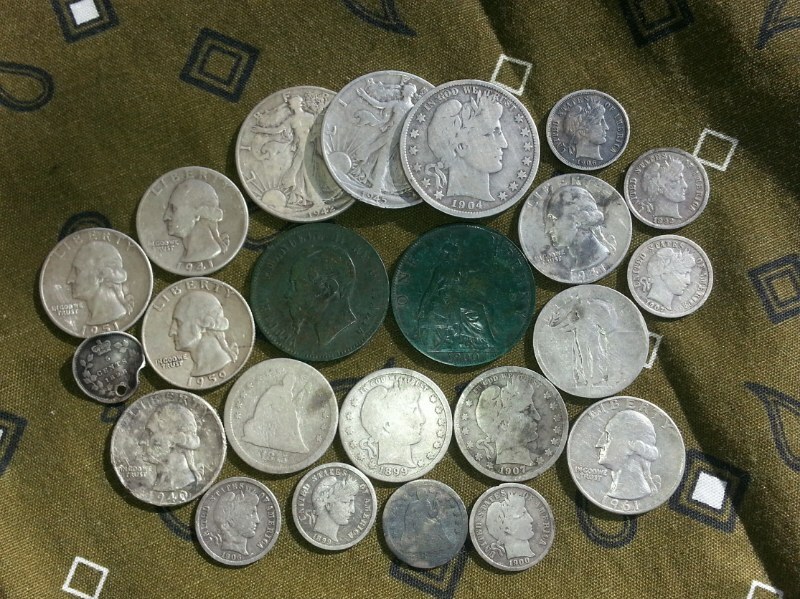 Here are my finds for 2013 and 3 months or so of 2012.